This is so perfect! Lapis as mermaid, and Peridot as a princess. This is great!! 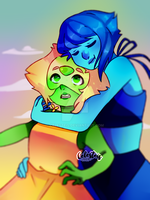 I always enjoy the combination between my Favorite Blue Gem + my favorite mythological creature, and Peridot looks adorable as well.